If you’re at all familiar with social media, you’ve no doubt encountered the hashtag, a clickable word or string of words relevant to a specifi c topic, preceded by the # symbol. In a relatively short time, hashtags have become essential to businesses large and small on sites like Twitter, Instagram, Tumblr — and now Facebook — for generating new revenue and for client retention and referrals. Facebook differs fundamentally from Twitter and other social networking sites, and its integration of hashtags differs as well. Traditionally, Facebook has been more personal, and users are less likely to use the site to interact with brands and seek products. Your Facebook privacy settings override hashtags. If you post on your profi le or salon page using a hashtag, it doesn’t mean everyone can automatically see it. You must set your privacy settings to Public. If you use a hashtag in a post that you only share with a certain group of friends, for example, the post will only be visible to that group. Even when you add a hashtag to your post, your default privacy settings still apply. Search for hashtags or bookmark them on Facebook by URL. Use the URL: www.facebook. com/hashtag/ and then include your keyword on the end. 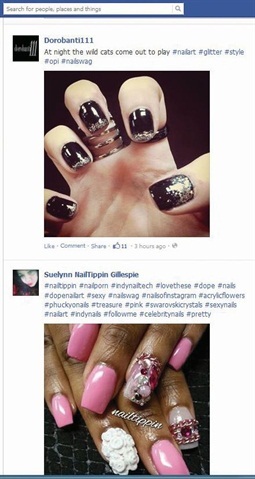 For example, type in www.facebook.com/hashtag/nailart, and you’ll land on a list of posts about nail art. Use the hashtag search feature to fi nd new pages and potential clients. Hash tagging your own content can also help you keep track of it. If you tag your posts with #jessicanailartist or #jessicanaildiva, then expect when you click on that hashtag to see all the content you’ve tagged in that manner. Use hashtags to promote contests. “Creating a contest where your entry includes the business’ hashtag or contest name at the end (e.g., #nailsonmain,#nailsabouttowncontest) is an effective way of getting guests and hashtags working together,” explains Shannon Leehr, an educator for STX, a salon software company. The caveat is that because of Facebook contest promotional rules, people can’t enter your contest on Facebook by clicking on your hashtag as they can on other social media sites. But they can find your contest across several platforms by seeing the hashtag promoted in your Facebook posts. Additionally, you might inadvertently use a hashtag that’s already in use for a brand that’s completely unrelated to your topic. Review Pinterest, Twitter, Instagram, and Google+ to make sure your hashtag is not already in use by other brands. “Every business and nail artist should have their own call sign or hashtag to link back to the business,” Leehr says. “It shows all the work completed by this business or artist and suggests whom to ask for. 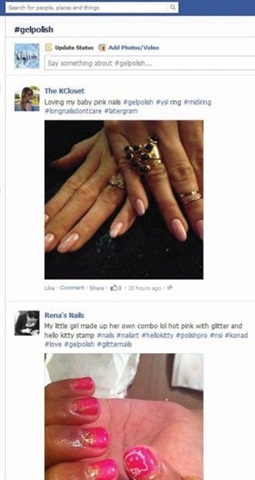 Techs can use this hashtag as their portfolio too.” Example: #askforkimmy, #phoenixnails. You can also occasionally tag more generally to let locals fi nd you by area and stumble across your business: #phoenix, #phoenixdeals. Monitor Your Results. On Twitter, popular hashtags are displayed on a “trending” section. According to Dixon, however, some early evidence shows that hashtags in Facebook posts may actually hurt their chances of going viral. Some brands have created aggressive marketing campaigns using hashtags on Facebook, but because of the more personal nature of Facebook, marketing that is too blatant and promotional is likely to drive less engagement, fewer clicks, and less reach. Ultimately, your goal in using hashtags in your Facebook posts is to engage an audience who may not have seen your post otherwise. Fortunately, you can monitor the results in Facebook Insights. Keep an eye on your Reach and Engagement Numbers; these will reveal whether or not your hashtags are effectively boosting your posts. At the top right-hand of your Facebook page, click Insights, then click the Reach column to see which of your posts are getting the highest Reach. #manicure, #pedicure, #nailswag, #naturalnails, #gelpolish. Here are some salons that have had success using hashtags on Facebook. Typethe name of the page in Facebook’s search bar, then scroll through the pages tosee examples of hashtags at work. Visit www.nailsmag.com/hashtag101 to learn about hashtag basics.